Approximately, 1 million people in the United States presently have aphasia and close to 200,000 Americans are diagnosed with it every year, according to statistics from the National Aphasia Association. The majority of people who have aphasia are adults — middle-aged and older. However, young children can also develop the disorder. Aphasia is a condition that is caused by damage to the section of the brain that controls speech. Most commonly, this area is on the left side of person’s brain. Aphasia can occur immediately following a stroke or head injury, yet it can also develop gradually due to a brain tumor or advancing neurological disease. This condition impairs a person’s understanding and expression of language, and hinders the ability to read and write. Aphasia can also co-exist with other speech disorders resulting from brain damage. In most cases, aphasia occurs after a stroke, a serious brain injury resulting from the stoppage of blood flow to portions of the brain. This happens when a blood clot is present, or when a blood vessel is leaking or has burst. When there is a lack of normal blood flow, brain cells are destroyed because they don’t receive oxygen and nutrients. Infections, tumors, physical head wounds, and diseases such as Alzheimer’s can also cause brain injuries. Patients with Broca’s aphasia have experienced damage to the frontal lobe of the brain, and they often have paralysis or weakness on the right side of their body. These patients usually comprehend speech and can think clearly about what they intend to say. However, it takes great effort to speak and they resort to using short sentences. Many times this is very frustrating to the patients since they are cognizant of their limitations and the inability to clearly express what they want to say. When the temporal lobe of the brain is injured, this can result in Wernicke’s aphasia. In this case, patients typically speak in long, incoherent sentences, using extra unnecessary words and phrases, and even making up words. The patients’ understanding of speech is impaired, as well as the ability to realize their verbal errors. Global aphasia is the result of damage to large areas of the brain that control language. This causes severe communication impairments, and patients may experience extreme limitations with their speech and language comprehension. It may be impossible to speak even a few words and they will often repeat words. With some brain injuries, the blood flow is interrupted just briefly and restored quickly. This is referred to as a transient ischemic attack (TIA), which is considered a mini-stroke. When a TIA occurs, a person’s language abilities will be impaired only for a short time and can return within a couple of hours. TIAs don’t cause permanent damage but they can warn of a more serious issue and precede a full-blown stroke. 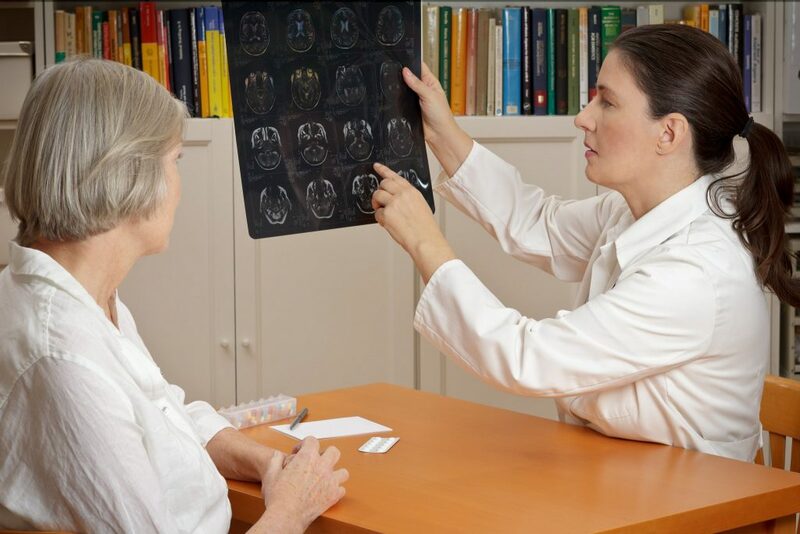 Physicians can diagnosis aphasia by having a patient undergo an MRI or CT scan to verify the brain injury and its location. A physician will also test the patient by using verbal cues, asking questions and having the patient follow commands. If aphasia is positively diagnosed, the patient will see a speech-language pathologist, who will assess the patient’s overall ability to understand and communicate. Fortunately, after a brain injury, considerable changes occur in the brain cells that contribute to the healing process. Even without treatment, patients can have significant improvements in their ability to communicate during the first few months. However, speech-language therapy is usually required so that patients can recover to their fullest extent. Therapy helps patients to use their remaining language capabilities and reestablish the skills that were lost. Therapists may also teach patients new ways of communicating by using pictures, gestures or electronic devices. Advances in technology have presented aphasia patients with innovative ways to receive therapy. For example, virtual speech-pathology sessions can be conducted via computer, thus allowing patients to receive treatment in the comfort of their own homes. In addition, speech-generating mobile applications (apps) can be used to help patients adapt to their condition. Mobile apps, such as Speech Assistant AAC and Text to Speech! are available in the Apple App Store. With the help of this technology, users can “speak” by typing text into their mobile devices and the text is converted to an audible voice. Although treatment for aphasia can vary depending on the patient, all treatment options are enhanced when the patient incorporates frequent interaction with other individuals. Patients are encouraged to participate in special interest groups or book clubs. These social situations can do wonders for helping patients regain their self-confidence and people skills, while also allowing them to use the tools they’ve learned in therapy. The involvement of family and dear friends is also an important aspect of recovery since they will have the most communication with the patient. Loved ones should consider participating in therapy sessions and be mindful to include the patient in all relevant conversations — allowing the patient ample time to talk and resisting the urge to correct any verbal mistakes. Overall, during treatment, it’s important to celebrate every milestone with aphasia patients, no matter how slow or small the progress seems. With persistence from the patient and intentional participation of loved ones, overcoming the effects aphasia (particularly following a stroke) can be promising. Are you caring for a loved one with Aphasia? Smithlife Homecare is here to help 24/7. Just give us a call.